Diamond jewellery and corgi cuddles - oh if only we could live like the Royal Family for just one day! With another member of the monarchy entering the world, you’ll be forgiven for wondering what life would be like as a princess/prince. Like you, we couldn’t be more excited to celebrate this joyous event. Alas, as Lorde famously sang ‘And we’ll never be royal, it’s just not in our blood’ - that doesn’t stop us from pretending otherwise, though! You don’t need years of royal heritage to revamp your humble home in true Buckingham Palace style. Our indulgent designs are fit for kings and queens, bringing sophistication and class with just an afternoon of DIY. Today is one of the Queen’s birthdays, so we can’t think of a more opportune time to explore different ways to decorate your home like a royal. The delicate swirling scrolls of our Athena White/Gold wallpaper are the perfect way to add a regal touch to your home. This textured wallpaper displays illuminating mica that reflects the light around your room, in a beautiful flowing motion that follows the curved pattern. On a backdrop of textured cream paper, these scrolls glide across your walls to offer a gorgeous look that you’ll find easy to incorporate with matching soft furnishings. You might not have your own personal collection of tiaras to show off, but our stunning Crowns/Coronets wallpaper puts the Crown Jewels to shame (sorry Liz!). 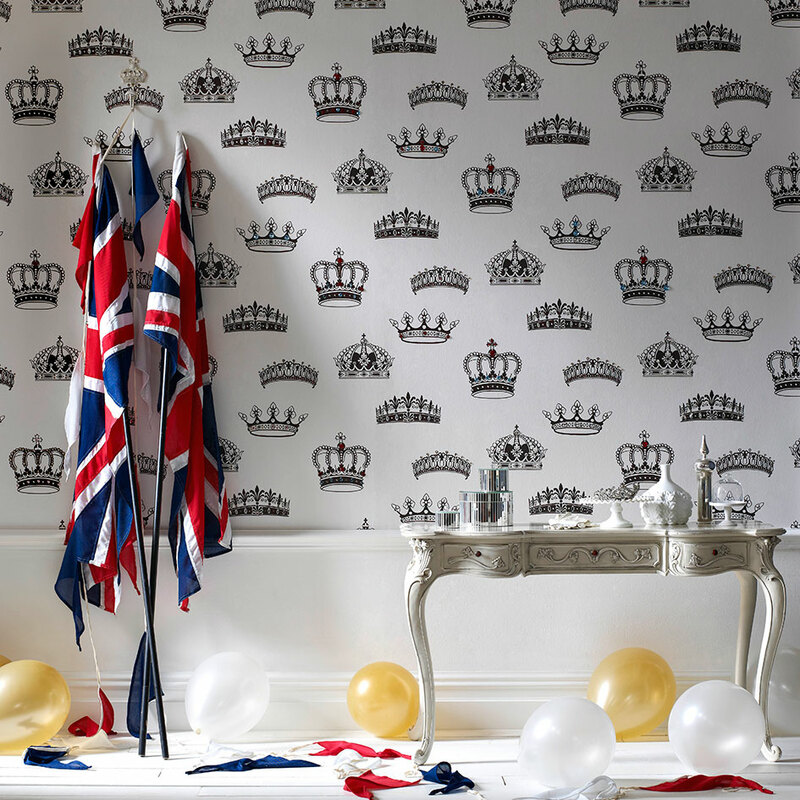 This design harks back to our original coronation-inspired wallpaper from 1952. 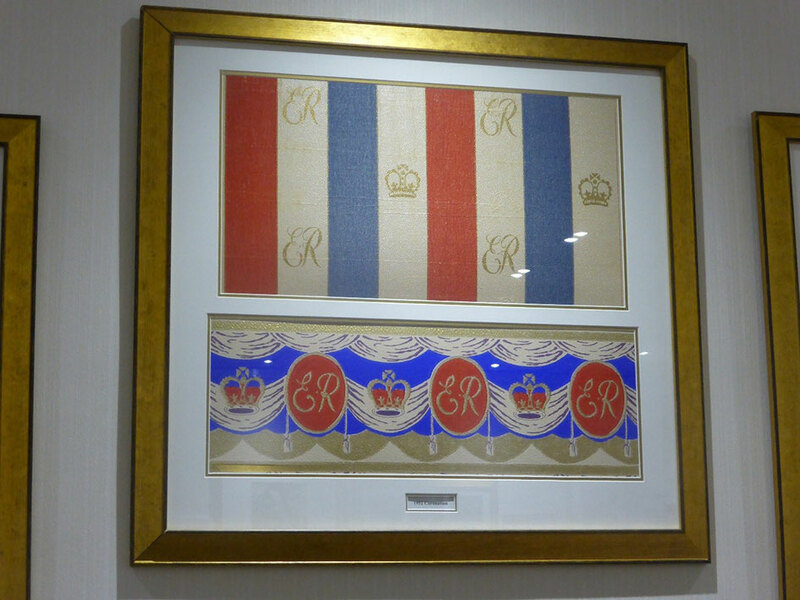 We’re big fans of the Royal Family and it seemed only fitting to celebrate this prestigious occasion in true Graham & Brown style! We sold every roll that we made of this glorious motif, yet back in the day it was mainly used for table runners and bunting. You can always trust the British public to be so savvy and creative with their street parties. We’ve been around for quite some time and we feel quite sentimental towards the Royal Family, hence why we re-released the crowns/coronets pattern in monochrome for the wedding of Prince William & Kate Middleton in 2011. For a more traditional motif, our Original Gold wallpaper has a distinct 50s feel that remains stylish over time. Whilst this soft colour palette may look like a colouring book waiting to happen for youngsters, the Duchess of Cambridge would have nothing to worry about when applying this wallpaper to her home, as its durable finish makes it extra-washable. Practical and stylish, this motif is the ultimate touch of opulence for family homes. 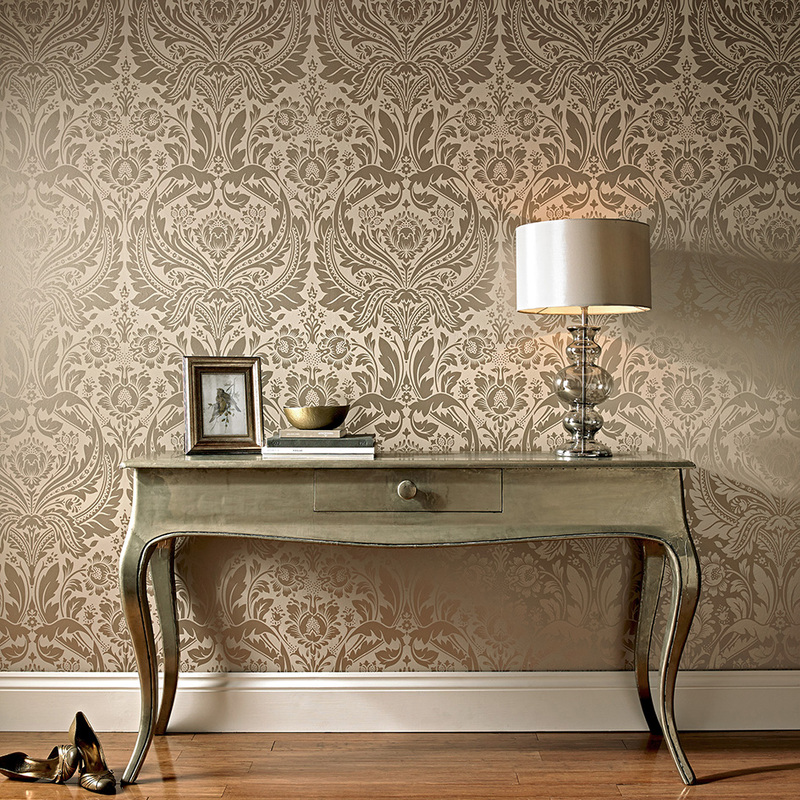 Damask wallpaper embodies a real sense of royalty, particularly our Desire Taupe/Metallic design. 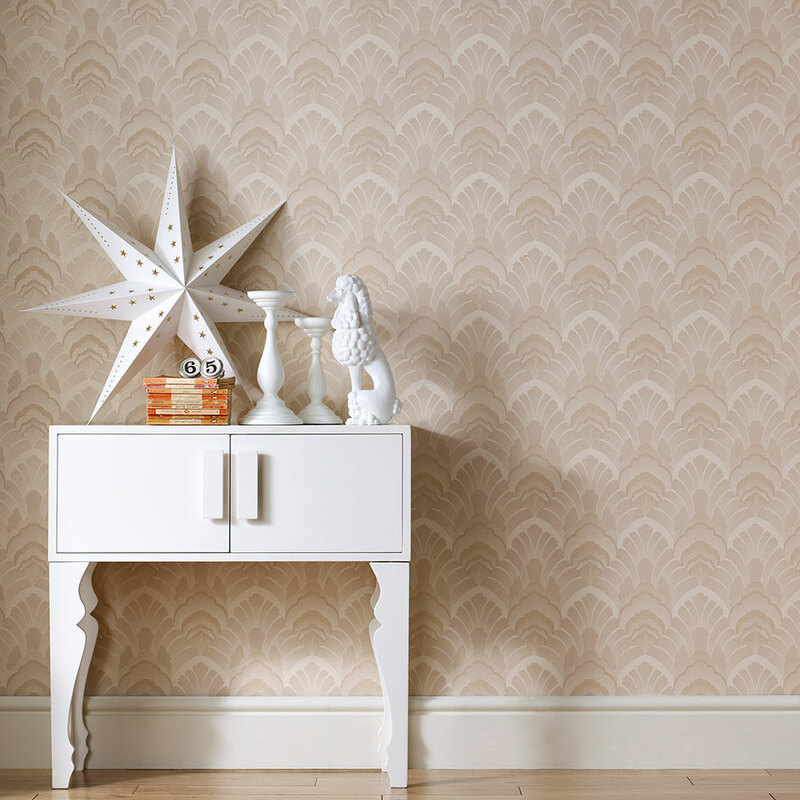 Coating your walls in golden lustre, this wallpaper is a total showstopper! You can really imagine such an opulent pattern being displayed in the halls of Buckingham Palace. Hailing from our Elixir collection, you can use this wallpaper on all four walls, or combine it with another matching motif from the range.